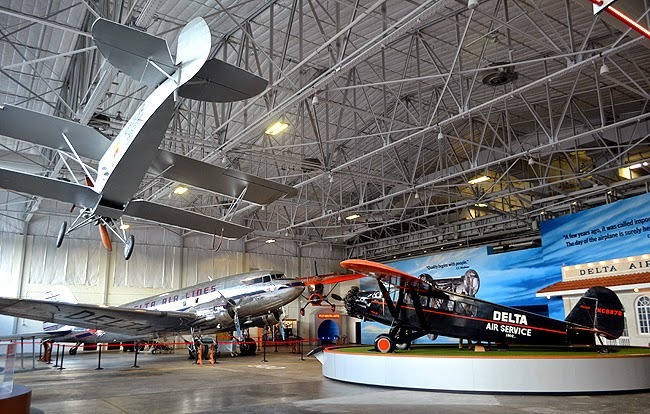 The newly renovated Delta Flight Museum (formerly called the Delta Air Transportation Heritage Museum) has undergone a magnificent renovation...they're really going places! 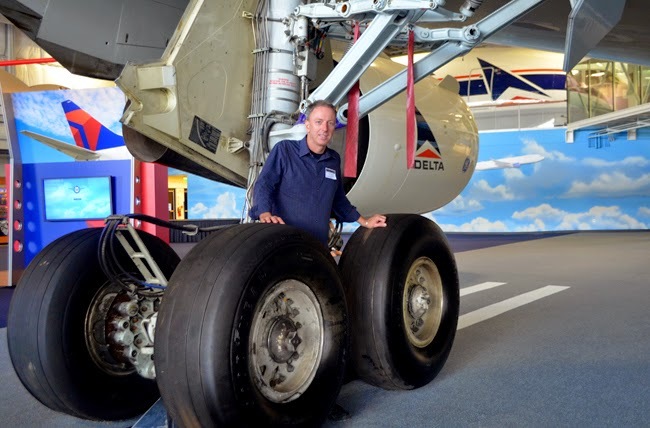 Puns aside, the Delta Flight Museum is an aviation enthusiast's dream land...68,000 square feet of dream land! 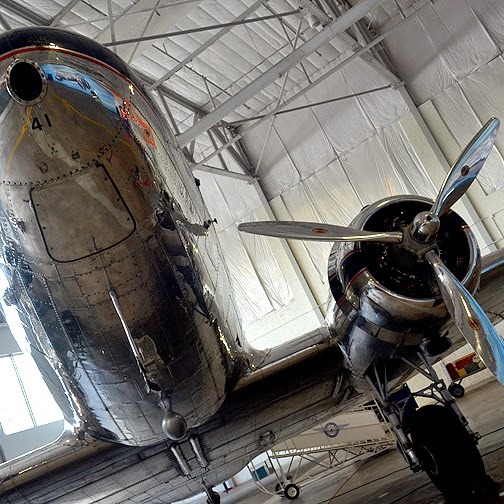 The museum opened in 1995 in two 1940s-era hangars, originally used for Delta's maintenance program. Hangar 1 was built in 1941 and Hangar 2 in 1947. Today, the museum offers interactive exhibits and rare artifacts, as well as some of the latest exhibit technology. 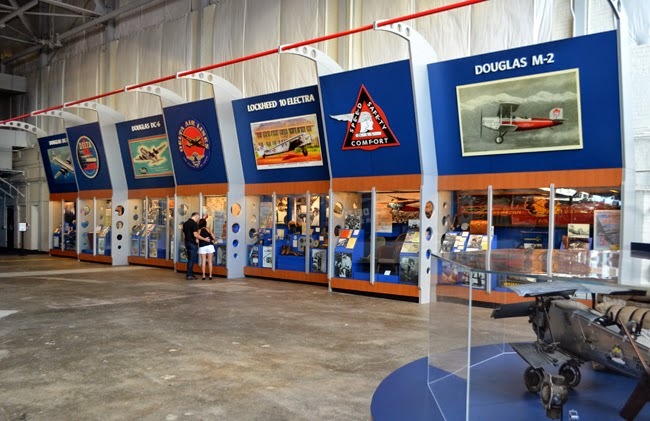 Some of the aircraft artifacts date to the 1920s and they feature the only Boeing 737 flight simulator open to the public in the United States. Beyond the fascinating museum experience, it's also available as a special events facility (there was even a wedding proposal at the museum recently) and their gift shop is pretty awesome, too...I've rather enjoyed my "I love the smell of jet fuel in the morning" coffee mug! The first time I was ever in an airplane was on a runway on Craig Field in Jacksonville, Florida. Local radio air traffic reporter Robbie Rose of WQIK allowed me to taxi the runway with him to make some photos of the world-famous "Charlie Lindbird", a ring-necked pheasant that had been following Robbie's plane on the runway! I'd convince my mother to call Mr. Rose to see if I could visit the airfield and make some photos of Charlie Lindbird, and to my great surprise and excitement, he said, "Sure!" I wanted to see the bird, of course, but my endgame was to make a drawing of Charlie Lindbird to give to Robbie Rose. I was a budding pencil and paper artist at the time (later the camera replaced my artistic endeavors). I made the drawing and sent it to Robbie and my mother still has the photos that I made of Charlie and there are a couple of Robbie and I next to his plane. What an awesome memory! "Thank you, Robbie Rose" for encouraging a teenager's love of aviation and sense of adventure, which prevails even today! A testament to the airline industry's continuous and exponential growth, Hangar 1's roof was raised three feet in 1952 to accommodate larger aircraft. The most recent renovation was completed in 2014, and reopened to great fanfare. It took me a few months after the reopening to make it down there to visit again, but now I can hardly wait to go back! The museum is at Delta headquarters, so be prepared to show a government-issued photo ID when you visit. If you visited prior to the recent renovation, you'll recognize some of their staple artifacts, but you'll discover a lot of new ones, and all of them are presented in a new, totally modern fashion. The museum is presented in something of a timeline order. Hangar One features "The Propeller Age", chronicling the evolution of luxury air travel, and a Stinson Reliant, an aircraft series that was built 1933-1941. Hangar Two features "The Jet Age". Make plenty of time to explore both hangars. There's a lot to see! "Project 767", an effort led by three flight attendants, was a demonstration of employees' gratitude to Delta for its support throughout the years. During a challenging financial climate, employees, retirees and friends raised $30 million to pay for Delta's first Boeing 767. That's some serious employee dedication! Twenty-four years after its inaugural flight, The Spirit of Delta was unveiled as the newest exhibit at the museum on December 15, 2006. 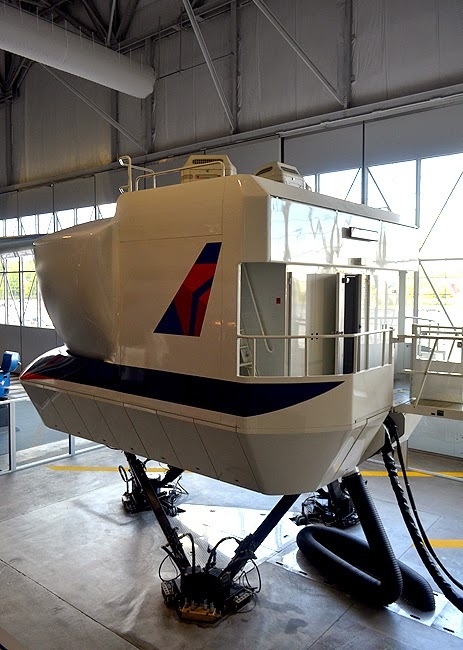 The Flight Simulator is so much more than a "ride"...it's an experience. We only got a preview, but "Wow! ", I can totally imagine—having been at the controls of a couple of in-flight planes, with flight instructors, of course—how awesome it is! The Flight Simulator was a highlight of our visit—and the Simulator is made from a real airplane! We'd ventured by once and there was a group of people already "flying", so we explored more of the museum and came back later. Then there was only the flight simulator instructor and one other visitor, a young pilot visiting from Brazil and one you quickly determined works in the field because he's so passionate about flying. While we didn't do the full-hour experience, we were treated to a preview. Barry took the pilot seat and I was plenty excited to take the co-pilot seat. We saw a brief clip of the on-screen experience. Those partaking of the full package enjoy a 10-minute briefing, 45 minutes of flight time and a 5-minute review. If you're an enthusiast, I'm certain it's worth the ticket price. During my senior year of high school, in Pinedale, Wyoming, I ventured beyond the runway. There was a festival of some sort that included plane rides! I was so caught up in the festival activities and making photos that I missed out on the plane rides. I was so disappointed. But, Dominique Joris, a Swiss exchange student who had become my best friend, made arrangements with the pilot to take Dominique and me up the next day—my first flight! It was a four-passenger Cessna and we were flying over the stunning and majestic Rocky Mountains. Suffice it to say, it was a bumpy ride, but after that I was never afraid to fly. 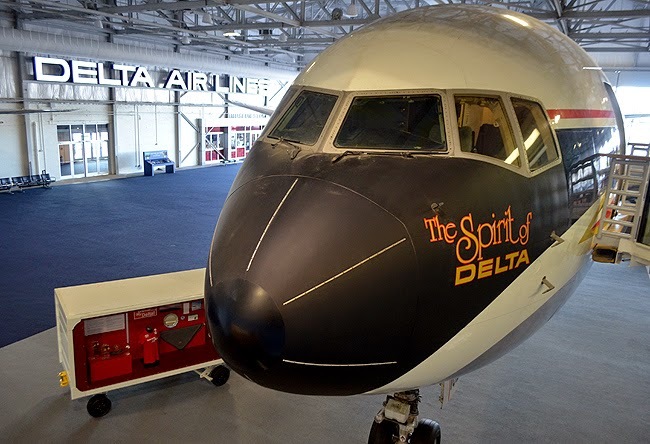 Inside The Spirit of Delta is another museum...one you want to make sure you see! The artifacts range from viewing the actual cockpit to the plane's intact, original First Class section, to uniforms, aircraft models, and pins to a period galley with mannequins, and there are cutout sections revealing the innards of the plane! 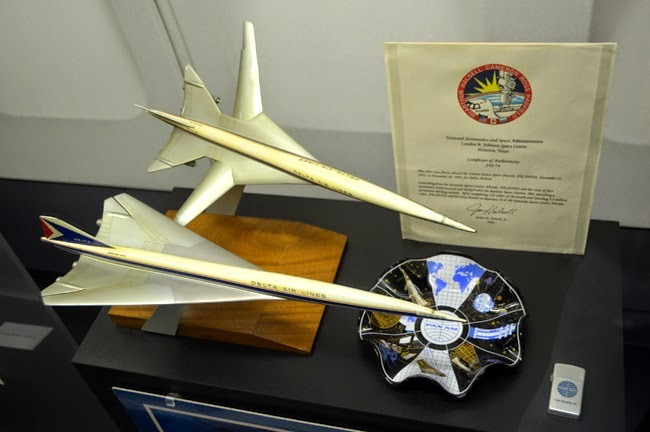 As an air AND space enthusiast, I was enraptured by the NASA and space-related artifacts. There's even a shirt that was flown aboard the Space Shuttle ATLANTIS for eight days in 1995! The shirt is one that bears the "Delta: The Official Airline, 1996 Olympic Games" emblem. In the 2000s, I had the great privilege of being a VIP guest of NASA and got to visit ATLANTIS on her launch pad, in addition to many other incredible experiences over a six day period. I love making connections to real-life experiences when visiting museums! Delta's uniforms have, over the decades, reflected current and innovative fashion. 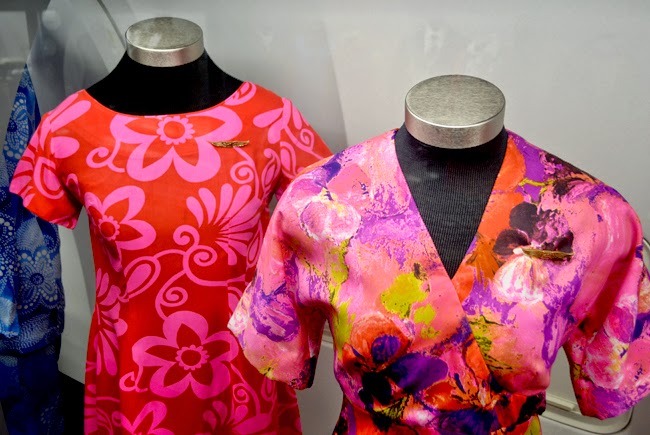 The "Hawaiian" uniforms pictured above were donned by attendants from 1969 through the 1970s. There's another uniform that was designed during the Space Race, looking toward the time that Delta might be part of consumer flights to the Moon! Seem silly? Then you might be surprised to learn that you can book a flight to space right now! Perhaps not through Delta, but their pioneering spirit is most certainly a contributor to the fact that civilians have already ventured into space. I think you're going to love all the photo-ops in the museum...I certainly had fun with my camera! Don't be shy about making photos, but of course be careful. 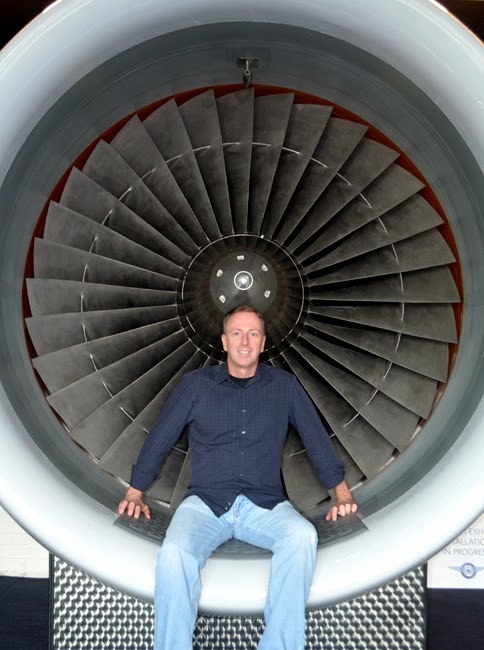 I have a very similar photo to the one above of myself at the Smithsonian National Air & Space Museum in Washington, DC about four years ago. Fun stuff! 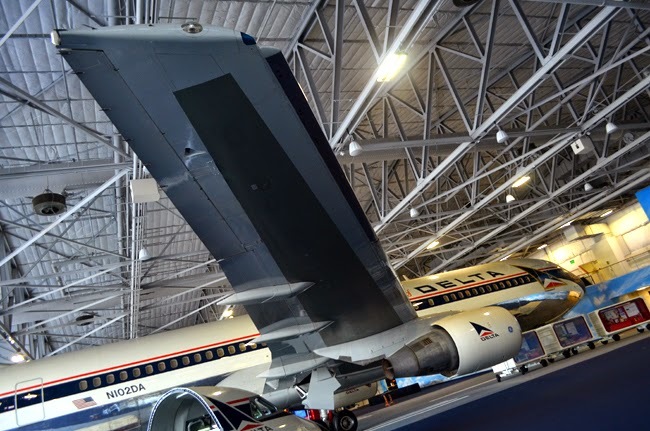 Next time I visit the Delta Flight Museum, I'm going to plan more time to explore. There's so much to see and do! And I can hardly wait to see their newest exhibit, Adventure of Flight, which "highlights man's quest to conquer the skies, from hot air balloons to space travel". It opened just last week!